I picked up this book at the same time as The Art of Being Normal from the "buy one get one half price" section in Waterstones, I knew I wanted TAOBN but I couldn't choose which of the others to pick, there were far too many that I wanted (we've all been in this position though, let's be honest)! Anyway, I finally decided to go with the one I had first laid hands on and there we were, two phenomenal books had been added to my bookshelf. 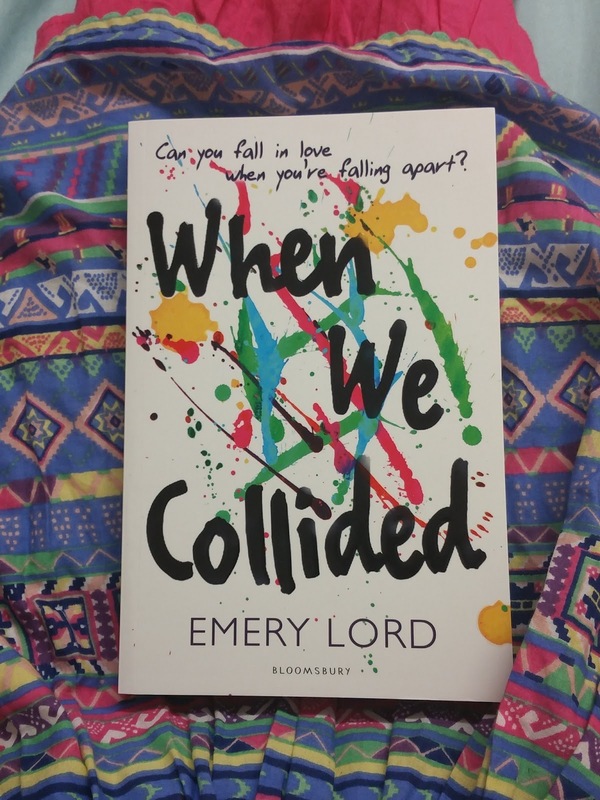 When We Collided is a heartwrenchingly accurate and beautifully written book which follows the story, through alternating first-person narrative chapters, of two characters and their lives in the small town of Verona Cove. Seventeen year-old Jonah, who lost his dad six months ago and is trying to look after his siblings whilst his mum battles depression in the room upstairs. And Vivi, a whirlwind of a girl who moved into town for the summer, leaving her friends and home behind her after things turned very messy (that's as much as I can stay whilst being, mostly, spoiler free!). Their lives are drastically changed by each other, as Vivi brings laughter into the home of Jonah and his five siblings for the first time in months. But it becomes evident that Vivi is not quite as happy and together as it may initially seem. She is battling her own issues, trying to get to grips with who she really is and understanding the diagnosis she has been given and what that means for her. There are so many twists and turns in this novel, it took off in ways I never imagined before I opened it and you truly will feel every single emotion whilst reading it. Lord has written these two intertwining stories so fabulously, looking at mental health related problems both from the side of the family member and the sufferer themselves. The descriptions of mental health which are given are so truthful and the way in which these people's lives are affected is honest and not sugar coated or dramatised in the way that you so often see in media. As someone who has first hand knowledge of what it is like to be in some of the dark places mentioned in this book I found it really encouraging to see it written so well. This is a perfectly written story that includes all of the excitement and joy of new found love whilst documenting the darkness which comes alongside mental health and the ways in which all of these aspects interlink. A truly beautiful story that people who have experienced mental distress will relate to but which will also provide educational insight into what these issues are like. End note: One other thing that made When We Collided so special for me is that it included a couple of off-hand mentions about non-heterosexual couples! Just a little remarks (e.g. that one of the female characters has a wife) which just sneak in a little bit of equality where the author could so easily not have done so. It's just a tiny thing that makes me even more in love with this fantastic book!